Currently, two members from the EWB project Waccess (short for water access) are performing a field study in the village of Tatum in Cameroon. This post will describe the project as well as the first days in Cameroon. Waccess is a continued collaboration between EWB and the Cameroonian NGO Afoni children of hope foundation (ACOHOF). So far two projects, installation of solar panels and a computer lab, have been completed together with ACOHOF on their family farm school (FFS) in the village of Tatum in Cameroon. The project Waccess aims to continue the successful collaboration with the local partner organisation, but this time focusing on the critical water situation in Tatum. For the past year, members of the Waccess project have been working on ideas to improve the water access for students and staff at the FFS as well as other members of the community in Tatum. The original plan was to understand the water situation and come up with a solution in Sweden before travelling to Tatum to implement a technical system. 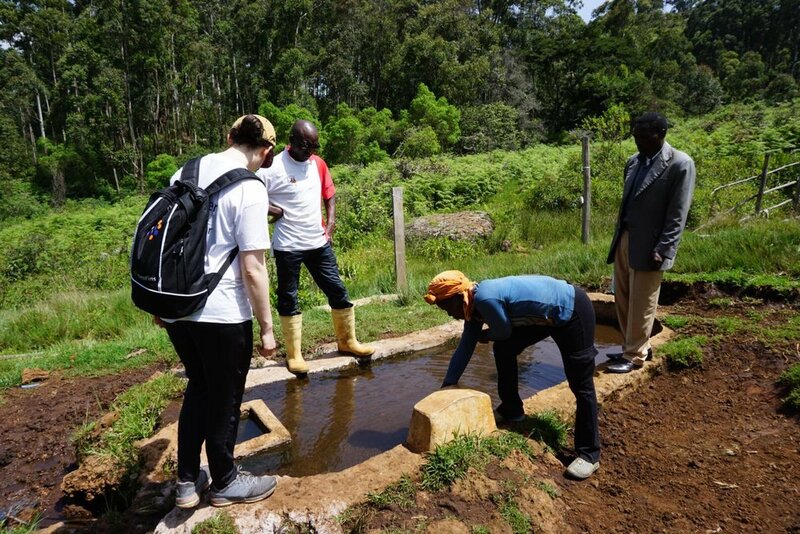 However, the group realised that it was not possible to understand the current water situation well enough to determine the best solution back home in Sweden. Therefore, it was decided to do a field study in order make the most out of the project and to eliminate the risk of choosing the wrong approach. Tatum is a village located approximately 2000 meters above sea level in the northwest English-speaking region of Cameroon and to go here, you have to drive through the French region. The two regions are currently in a dispute about, to be short: equal rights. The dispute is noticeable in Cameroon since the anglophones have been demonstrating against the French government which has responded by announcing a curfew between 9 pm and 5 am and by cutting the internet access from time to time. Many schools are either closed or not fully staffed due to the protests. When arriving in Tatum we who are representing EWB spent our first time getting to know the surroundings and the staff at ACOHOF. During the first three days in Tatum different meetings have been held with staff at ACOHOF. We have also had the chance to visit the ACOHOF family farm school (FFS) to examine their water sources and usage. Before the trip to Tatum, the Waccess group were quite confident that a rainwater harvesting (RWH) system at the FFS would be the best solution and a workshop with focus on RWH was prepared and ready. However, from the conversations that we have had so far and from the visit at the school, we are no longer sure that a RWH system is the best way to increase the water access in Tatum. It seems like the villagers wish to use other types of systems, like catchment areas and pipelines from natural springs, to increase the water access. Therefore, the decision of performing a field study has proven to be a good choice, but on the other hand, the development of the Waccess project might take an unexpected path. We will use the rest of our time here to identify the water-related issues concerning the school’s and villagers’ needs and desires. Hopefully, we can then, in collaboration with ACOHOF, come up with a good and suitable solution to improve access to water in Tatum.